A source defines a set of configuration parameters to extract and index Microsoft SharePoint content. This topic describes how to create a source using the second generation SharePoint connector. 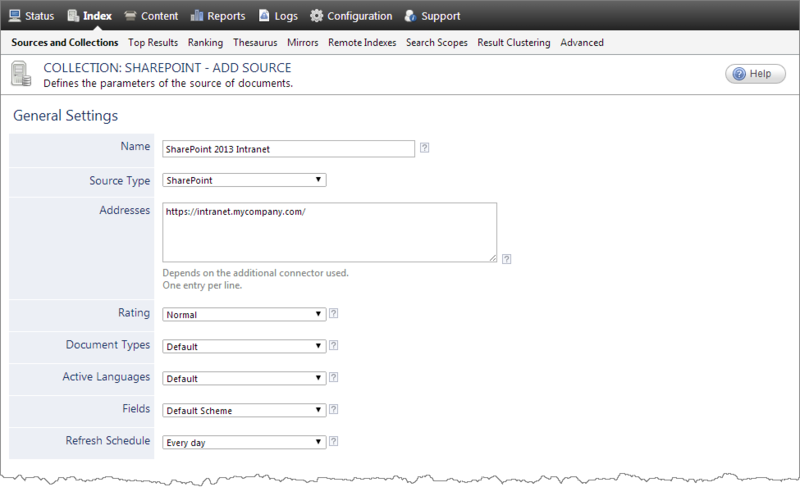 In an environment with more than one Microsoft SharePoint Web Application, it is recommended to define one source for each Microsoft SharePoint Web Application that you want to index, and only index user profiles once to not create duplicates in your index (see Modifying Hidden Microsoft SharePoint Source Parameters). CES 7.0.6830+ (July 2014) The SharePoint source type is for the second generation SharePoint connector. When you are still using the original SharePoint connector to create your SharePoint source, ensure to rather use the SharePoint Legacy source type (see Configuring and Indexing a Microsoft SharePoint Source With the Legacy Connector). Enter a descriptive name of your choice for this source. Example: When you have more than one SharePoint site to index, you can include in the name information to help distinguish between them. The connector used by this source. In this case, select SharePoint. Note: CES 7.0.6767– (June 2014) The SharePoint type corresponds to what is now the Legacy SharePoint source type (see Configuring and Indexing a Microsoft SharePoint Source With the Legacy Connector). List of specific SharePoint farm sections that you want to index. If you need to index more than one section, enter one URL per line. Note: CES 7.0.6942 (August 2014) Starting addresses must end with /. Important: A specific folder in a list is not supported. Note: You can also use the source Crawl Scope parameter to control more precisely the content to crawl (see below). Select the field set that you created for this source (see Microsoft SharePoint Connector Deployment Overview). Time interval at which the source is automatically refreshed to keep the index content up-to-date. Note: The default Every Day option is typically good, but when your SharePoint content changes frequently within a day, after creating your source, you should schedule incremental refresh at significantly shorter time interval to continuously index ongoing SharePoint content changes (see Scheduling a Source Incremental Refresh). You can then consider to refresh the source weekly by selecting the Every Sunday option. Example: If this source was for a legacy Intranet, you may want to set this parameter to Low, so that in the search interface, results from this source appear later in the list compared to those from other sources. In the Number of Refresh Threads box, when your Coveo server has available CPU cores, consider increasing the number to easily and significantly increase the crawling performance. The default value is 2. In the Mapping File box, leave the default value to use the default mapping file (Coveo.CES.CustomCrawlers.SharePoint.MappingFile.xml). When you identify that some custom SharePoint content is not indexed or not properly mapped, consider creating a custom mapping file, and then enter the full path to the file (see Creating and Using a Custom SharePoint Mapping File). CES 7.0.6830+ (July 2014) In the Crawling Scope drop-down box, select the option for the content type that you want to crawl in relation with the source Addresses that you specified (see above). Select WebApplication, the default value and highest element type in the SharePoint farm (tenant in SharePoint Online) hierarchy to crawl everything. In the Authentication Type drop-down list, refer to the following table to select the authentication type value corresponding to your SharePoint environment and the type of User Identity that you assigned to this source (see Microsoft SharePoint Connector Deployment Overview). In the Parameters section, click Add Parameter when you want to show and configure advanced hidden source parameters (see Modifying Hidden Microsoft SharePoint Source Parameters). In the case of an ADFS environment, when the Authentication Type parameter value is either AdfsUnderClaims or SpOnlineFederated, you must add ADFS related hidden parameters (see ADFS Related Parameters). CES 7.0.8541+ (September 2016) When you create a SharePoint search service application to list your user profiles, you must add the following hidden parameters (see LoadUserProfiles and UsePeopleSearchForUserProfiles). CES 7.0.9272+ (March 2018) When your SharePoint instance uses Okta as a single sign-on provider, you must add the OktaRealmand OktaSignInUrl parameters, and the corresponding values that you previously retrieved (see Okta Single Sign-On Provider for SharePoint On-Premises). When you select this check box (recommended), at indexing time, CES creates HTML versions of indexed documents. In the search interfaces, users can then more rapidly review the content by clicking the Quick View link rather than opening the original document with the original application. Consider clearing this check box only if you do not want to use Quick View links. In the Authentication drop-down list, select the user identity that you created for the Microsoft SharePoint farm (tenant in SharePoint Online) (see Microsoft SharePoint Connector Deployment Overview). In the Security Provider drop-down list, select the SharePoint security provider that you created for this SharePoint source. Click Save to save the source configuration and consider revising advanced source parameters before starting indexing the new source (see Modifying Hidden Microsoft SharePoint Source Parameters). Click Save and Start to save and start indexing immediately. Note: When your SharePoint Web Application uses Claims, the first time the SharePoint search interface is accessed, the first time setup page appears to let you enter your Claims information and allow access to the search interface (see Coveo .NET Front-End First Time Setup).